The new Nexus 5X has broken cover and right after the buzz, it's time to take a deeper look at its more important new features. The much anticipated successor to the Nexus 5 brings more than specs alone can tell: it brings pure, stock Android 6.0 Marshmallow with the wonderful promise of two years of constant and quick updates to the latest Android that Google has in store. While making it does involve some compromises - and you probably all know by now that the Nexus 5X lacks microSD card slot, drops wireless charging, and features no OIS, Google claims that it makes up for many of those in its own ways via the new features offered with the phone. 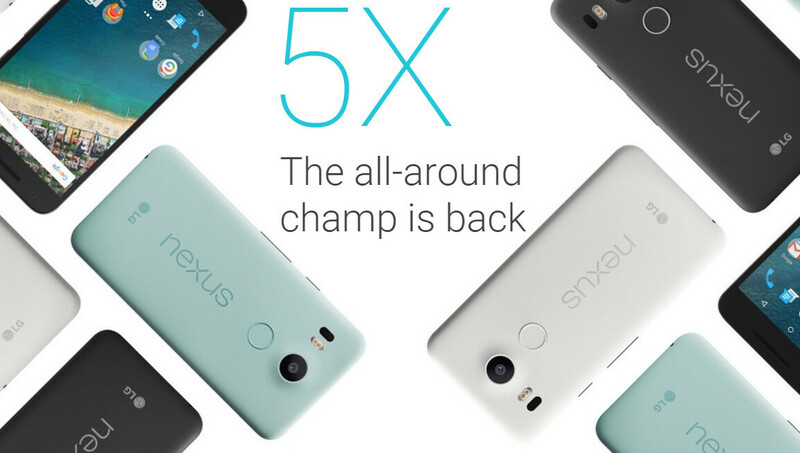 With no further ado, here all the important new features of the Nexus 5X. The Nexus 5X features a 5.2-inch display, slightly larger than the 5.0-inch screen on its predecessor, the Nexus 5. The screen retains a 1080 x 1920-pixel resolution, but pixel density is a bit down to 423ppi, which is still results in a very sharp picture. What's interesting is that Google uses Gorilla Glass 3 protection here rather than the latest Gorilla Glass 4 it has on the Nexus 6P. The Nexus 5X is the launchpad for the new version of Android, 6.0 Marshmallow. The two most important - or at least most publicized - eatures of Android 6 are its Now On Tap smart contextual tips and huge improvements in power management in stand-by with the new Doze feature. Google even bragged about Doze alone bringing an up to 30% improvement in battery life on the 2013 Nexus 5. The Nexus 5X comes in a choice of three colors: Carbon, Quartz, and Ice. The Ice is the stand-out new option, a mint-looking color that combines with a black front for a very distinctive visual style. The cool Snapdragon 808 system chip is what makes the Nexus 5X tick. It's a hexa-core chip with two Cortex A57s taking on the most demanding tasks and four Cortex A53s that are in use when the phone needs to lay back with less demanding apps. There is also 2GB of RAM on board, and - interestingly - it's of the slower, LPDRR3 variety. The new fingerprint scanner on the Nexus 5X carries the fancy 'Nexus Imprint' name and it's a one-tap solution that is quick to register with a very fast, streamlined process. What's more: it's a one-tap solution, so that you don't need to first unlock the phone in order to fully unlock the phone. Naturally, Nexus Imprint works with Android Pay for wireless payments. Contrary to the rumors, the Nexus 5X does not have dual front-facing speakers (it looks like that). In fact, just one of the two front grills is for the speaker, but we still appreciate the fact that it blasts sound from the front, which is the logical place for a phone speaker. Also, the Nexus 5X feature three microphones for better noise cancellation effect in phone calls. 12.3-megapixel sensor with 1.55 μm pixels and an f/2.0 aperture lens. Video can be recorded at 4K (30 fps) or 120 fps for slow motion effect. In addition, there is a broad-spectrum CRI-90 dual flash for more natural-looking lighting. The other neat addition to the camera experience - which is the focus in this phone - is an IR blaster for faster focusing in low-light on nearby objects. We've seen it work well in the LG G4 and we expect it to be just as useful on the 5X. The new Burst Shot mode in the stock camera app allows the Nexus 5X to quickly capture a sequence of images and the phone would automatically create a clever GIF from them that you can easily share afterwards. If this reminds you of Apple's Live Photos feature, you're not alone, and we'd be curious to testing this out in more details. It looks fun! There are three notable abscences in the Nexus 5X: it lacks wireless charging that was built in the Nexus 4 and 5 (so that's a bit of an unpleasant surprise), there is no microSD card slot for expandable storage (that's no surprise), and finally, there is no optical stabilization in the camera. Google says that the fact that it uses one of the largest camera sensors on Android in the Nexus 5X, with large, 1.55µm pixels compensates for that and negates the need for OIS, and we're eager to test that claim. Samsung was the first to bring a quick launch physical camera shortcut with no dedicate shutter key, and now the Nexus 5X follows on that path. Just double click the power key on the side of the 5X to quickly go into the camera app from any place. This new piece of hardware allows the phone to use very little power while reading information from its multiple sensors, and this makes possible a number of features and is part of the excellent work that Google has done with battery life on the Nexus 5X and with Android 6.0 Marshmallow. This one is no surprise: rumors all agreed that the Nexus 5X will feature the new USB Type C connector, the expected successor to microUSB, and it's indeed here. And that's great news: USB Type C is reversible, so you don't need to find the right way to plug it in your port to charge/sync your phone, it supports quick charging via an open standard (and not Qualcomm's 'QuickCharge' tech), and it features cool, flat cables that you can now buy in all various sorts at the Google Store. The Nexus 5X might not be as affordable as the Nexus 5 and 4, but it's still an affordable phone. Heck, it's nearly half the price of flagships like the Apple iPhone 6s, and while it might not completely match these devices in the spec game, it comes with the promise for a stock, pure, and quick-to-updates Android experience. In fact, Google guarantees that the Nexus 5X will be updated to the newest version of Android for at least 2 years. Finally, you can simply go to Google.com/nexus to explore more about the Nexus 5X, and that's where you'd find a link to the 5X on the Google Store. Pre-orders are open right now, while actual availability is said to start in late October, as it will take 3 to 4 weeks for the phone to ship from its manufacturing factories. PA, any word on what to do if you preorder a 5x (or 6p) and want to use project fi? it seems that the project fi registration page is still only set up for the original 6. Fingerprint sensor on the back just doesn't cut it. doesn't cut what? have you tried it? As I said, doesn't cut it. I think it is little bit easier to put the finger on the back of your phone than bring it to your home button. Also its much faster and works while screen is off which is great. The athores from PA are just a bunch of Apple fanboys. Wtf you expect?